After A High School Baseball Game, A Hug Goes Viral They were competing to enter the state championship in Minnesota. But when one student pitcher struck out his childhood friend, he embraced him instead of celebrating his victory. After pitcher Ty Koehn struck out Jack Kocon, sealing the team's place in the state champion, Koehn ran over to hug his good friend. It was a hug that put sportsmanship on full display. A lot hung on the game: The winning team would play for the Minnesota state championship for baseball. Mounds View, a public high school in a Minneapolis suburb, was leading Totino-Grace, a nearby Catholic high school. Totino-Grace's Jack Kocon stepped up to bat, meeting eyes with pitcher Ty Koehn, his longtime friend. Koehn, reportedly the star player of his team, the Mustangs, struck out Kocon to win the game and move ahead to the championship. Cheers broke out, and the Mustangs rushed the field in celebration. But then Koehn did something rare: He ran to the batter, throwing his arms around Kocon. Nearby, his team was jumping and hugging each other without him. He held Kocon in an embrace that lasted about 10 seconds. "I knew I had to say something," he told Minnesota's Bring Me The News. "Our friendship is more important than just the silly outcome of a game. I had to make sure he knew that before we celebrated." The two players were on the same Little League team and have been friends since they were 13, Koehn said. The moment was caught on camera last Wednesday night by John Hakes, according to BMTN. 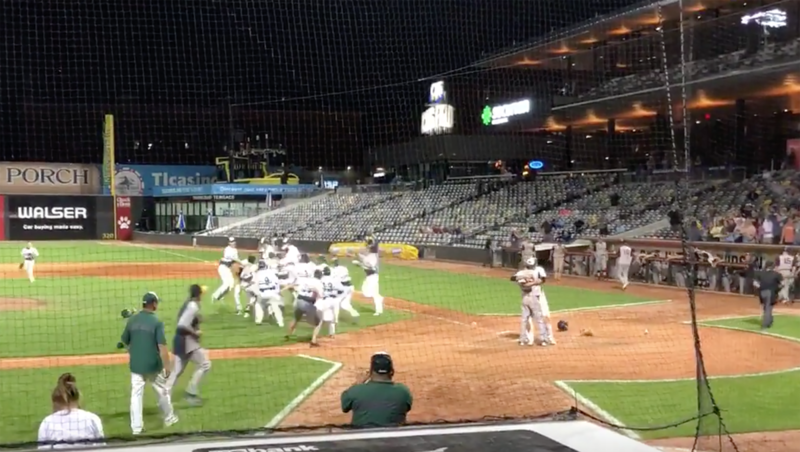 Mounds View baseball coach Mark Downey told the outlet, "Ty's actions the other night do not surprise me and are reflective of what I might expect from any one of the players on the team."